Maine plays host to UConn for a two-game home stand to wrap up the two programs' Hockey East season series. - Boston College and Providence meet twice over the weekend to close out their three-game series in Hockey East action. The Friars took game one of the series, 4-3, back on Nov. 3 in Providence. - The #9 Eagles enter the weekend riding a three-game winning streak after taking four points in a weekend sweep on the road at Vermont. They defeated the Catamounts by scores of 4-2 and 5-2. - Rookie Jillian Fey (Nantucket, Mass.) recorded the first goal of her collegiate career on Friday night, before going on to add an assist on Saturday. She closed out the weekend with a plus-four rating and three blocked shots. - Senior Megan Keller (Farmington Hills, Mich.) is just three points and two goals away from setting new single-season records for a defenseman in WHEA play. The current records stand at 28 points and 13 goals, while Keller boasts a 12-14--26 stat line. - Providence most recently posted a 1-1-0 record in a home stand against New Hampshire. The Friars shut out the Wildcats 4-0 on Friday, before the roles were reversed and they dropped a 5-0 decision on Saturday. - Sophomore Hayley Lunny (Bedford, N.Y.) lead the offense for the Friars in the victory, netting two goals and dishing out an assist. - Maine plays host to UConn for a two-game home stand to wrap up the two programs' Hockey East season series. The Huskies hold a 1-0-0 advantage heading into the weekend after taking game one of the series, 4-1, back on Nov. 10. - The Black Bears are back on home ice after giving up four points on the road at Merrimack last weekend. They were shut out by the Warriors, 3-0, in their first meeting, and fell, 3-1, in game two. - UConn looks to put a stop to a two-game skid after dropping each game of a home and home series with #3 Northeastern. They fell, 5-2, on the road, before giving up a 4-1 decision at home. - The #3 Huskies and Catamounts close out their Hockey East season series this weekend at Matthews Arena. Northeastern holds the advantage after skating to a 4-1 victory in their first meeting of the year on Oct. 30. - Freshman Alina Mueller (Winterthur, Switzerland) has stayed hot of late, posting four points (1g, 3a) over the weekend in a sweep of UConn. The rookie currently holds an NCAA-best 22 game point streak, tallying 14 goals and 21 assists in that span. She earned Hockey East Player of the Week honors for her efforts against UConn. - The Catamounts are back on the road after two weekends at home, looking to get back into the win column after dropping four points in league play during a two game home stand with Boston College. Saana Valkama (Pirkkala, Finland) posted a goal and two assists on the weekend for Vermont. - The Terriers and Warriors head into this weekend's home and home series locked at a stalemate after the two teams played to a 2-2 overtime draw when they first hit the ice together back in October. - Boston University is currently riding a five-game win streak, most recently topping Holy Cross twice. The Terriers defeated the Crusaders, 4-1, on Friday, before skating away with a 7-1 victory on Saturday. - Courtney Correia (Whitby, Ont.) led all NCAA rookies last week with four points. The freshman netted a goal in each game and added two assists on Saturday en route to being named Pro Ambitions Rookie of the Week. 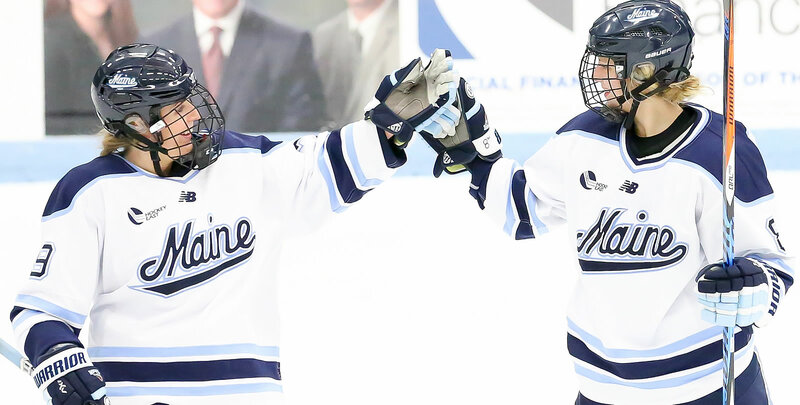 - Merrimack carries momentum from a weekend sweep over Maine into this weekend's match up with the newly-ranked Terriers. The Warriors shutout the Black Bears, 3-0, in their first meeting, before going on to knock them off, 3-1, in game two. - Senior Sam Ridgewell (Outlook, Sask.) turned away 61 of 62 shots she faced on the weekend, including 30 on Saturday to earn her fifth shutout of the season. - New Hampshire and Holy Cross close out their regular season series with a home and home series this weekend. The Wildcats own the edge coming into the set after skating away with a 4-1 victory in the teams' first meeting on Nov. 17. - The Wildcats are coming off of a weekend that saw them snap a three-game slide with a shutout victory over then-#10 Providence. They dropped the first game of the home and home series with the Friars, 4-0, before turning things around and skating to a 5-0 victory. - Kyra Smith (Littleton, Colo.) earned Hockey East Defensive Player of the Week honors for her efforts on the weekend. The senior recorded 69 saves across the two games, including a career-high 41 in Saturday's shutout victory. - Holy Cross enters the final two games of the season series with the Wildcats after dropping four points to Boston University in Hockey East play, falling by scores of 4-1 and 7-1. Victoria Young (Hanson, Mass.) had two points on the weekend, finding the back of the net once and dishing out an assist.